Productivity is vital to any business as it is directly correlated with profitability. Staying profitable is all about being smart, from building a productive workspace to adopting daily habits that allow you and others to be more efficient. Basically, when all resources are used in an effective and efficient manner, your business sees the best possible results. There may be days where you feel like you are extremely busy yet accomplishing nothing. All that may be required to increase the effectiveness of your effort are a few simple changes. Many efforts to increase productivity are fairly straightforward, and there are multiple factors that can affect overall productiveness. Productivity is a combination of intelligent planning and focused efforts. Whether you work from home or run a large business, there are a few basic principles that can help boost workplace productivity. One thing to evaluate first is the work environment itself. Ask yourself where you work best and when you get your best work done. Office setups, from home offices to large corporate offices, play a large role in productivity and can dramatically help improve your overall mood. Start by optimizing your work environment for productivity. This can not only apply to those who work from home, but also to your office space at work. Take a step back and evaluate your workspace. It is important to position your office furniture (even if it is just your desk and chair) in a way that promotes ease of use and a nice aesthetic. Consider using a monitor mount to clear up desk space and to position your computer in a way that is better for your eyes (and neck!). Position all of your equipment by the frequency of use and make your workspace as clear as possible. If you’re able, position your workspace near a window or in an area with good lighting, and this can dramatically improve overall productivity. If you’re in charge of a large office, make an effort to provide a relaxing atmosphere with comfy furniture, efficient equipment, and a few extra amenities. Some people work better in closed, secluded spaces while others thrive by being in the hustle and bustle of a busy office. 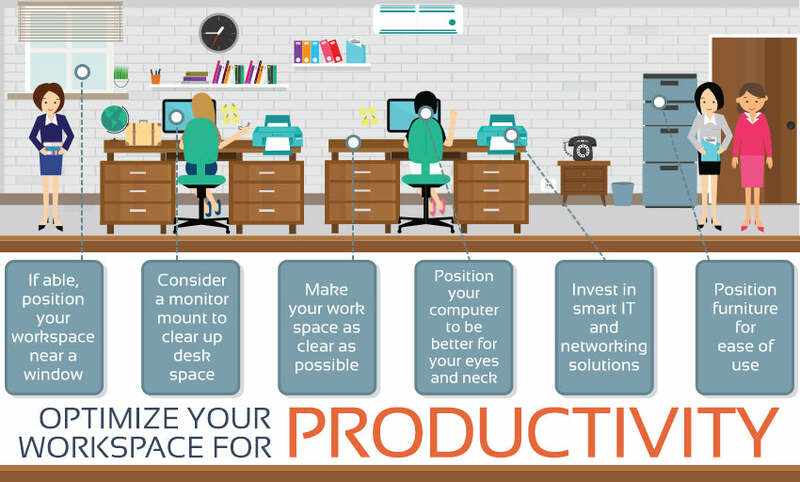 Providing multiple workspaces can drastically increase productivity in an office. Once you have built your workspace, make sure it is equipped with items that will help increase productivity. How annoying and distracting is a slow internet connection, especially when you’re trying to send emails or conduct research? Invest in smart IT and networking solutions, and you and your employees will be grateful. Begin with a networking installation. Most work environments, from home offices to large office buildings, will want a combined solution of wired networking and wireless networking. The networking category can cover everything, from your internet router, to your computer, to an HDMI network. It is basically how you are setting up your internet connection, but it can also apply to wiring your home theater system or conference room. It may seem complicated and daunting, but, with a few pieces of equipment, your work environment will be set up for productivity in no time. Networking installations apply to both wired and wireless networks. A wired local network is basically a group of devices connected to one another using networking cables, more often than not with the help of a router. The router is the central device of a home network into which you can plug one end of a network cable. The other end of the cable goes into a networking device that has a network port. These ports are called Local Area Network (LAN) ports, also known as Ethernet ports. Basically, LAN ports on a router allow Ethernet-ready devices to connect to one another and share data. In order for these devices to also access the internet, the router needs to have a Wide Area Network (WAN) port. Almost all providers will supply routers equipped with LAN and WAN ports. Most LAN ports can usually host up to four wired networking devices, though if you want a larger network, you will need a switch which adds more LAN ports to the router. 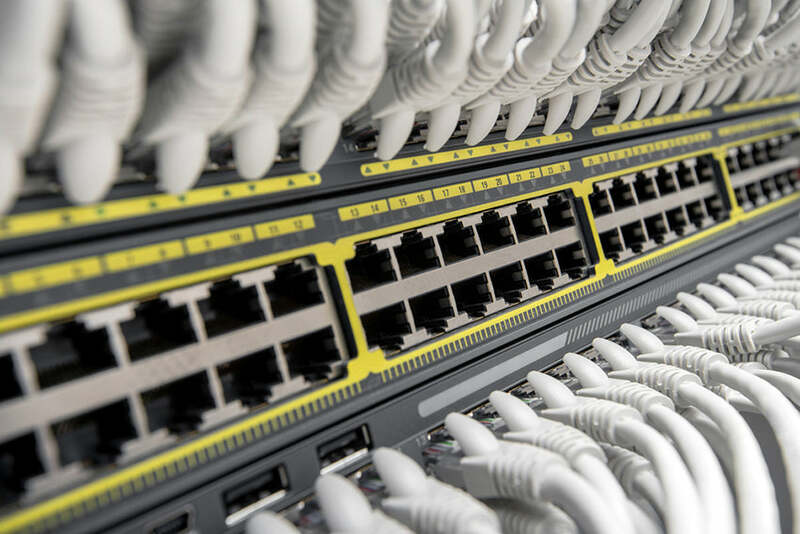 A networking switch helps increase the number of Ethernet-ready clients that a network can host. A switch uses a dedicated channel for each port, which basically enables the speed of the Ethernet to remain unchanged no matter how many ports are in use. 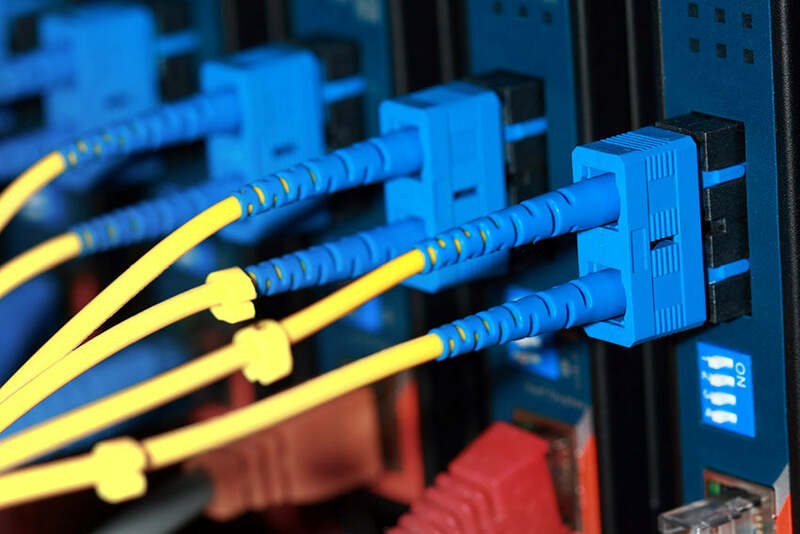 For a fast and reliable connection, consider using Cat5e, Cat6, or Cat6a networking cables to build your networking system. These twisted pair cables are considered the industry standard for connecting network devices to a router or a switch. The difference between the types of cables lies in the amount of data each one can transfer. Depending on the cable, they can handle data transfer signals of speeds from 100 MHz to 550 MHz. Networking cables are sold in a variety of sizes, including bulk sizes, so finding the right amount of cable you need is easy. If you don’t want to buy bulk wire, and the basic sizes fall just short of the length you need, extenders are also available to maximize your reach. If you need even higher bandwidth and have a large office where the system will be heavily used, fiber optic cables may be the preferred solution. A fiber optic cable is a network cable that contains strands of glass fibers inside an insulated casing. They’re designed for long distance, very high-performance data networking and telecommunications. They support much of the world’s internet, cable television, and telephone systems, as in they are used for major installations. For basic home installations, wired networking cables like Cat5e cables are more than enough to get the job done. A wireless network is very similar to a wired network, with one big difference: Devices don’t use cables to connect to the router and one another. They, instead, use radio wireless connections called Wi-Fi. Wireless networking devices don’t need to have ports, just antennas, and they can “talk’ to your wired connection. If the Wi-Fi connection isn’t strong, such as in your basement or the corner of a room behind thick walls, Wi-Fi range extenders are available. They provide a smooth, stable signal and can be adjusted to maximize signal strength. Wireless adapters can also boost signal strength and can usually be used in any room in the home or office. If you’re using a TV for video conferencing or presentations, consider adding an HDMI network. HDMI networks usually apply to home theater/home entertainment systems but they can also be a useful tool for increasing your workspace productivity. One HDMI cable can connect everything—your computer, gaming device, DVD player, and stereo—to your TV, to enrich your visual and audio experience every time you use a device. Now that you have your networking solution, consider adding items such as networking wall plates, which contain outlets for USB and HDMI devices. They easily connect to your existing electric outlets. Just snap on keystone jacks, and you’re good to go. Depending on your type of networking system, there may be a few wires and cables surrounding your workspace. One key to increased productivity is having a clear and clean work environment. A tangled heap of wires not only looks messy but can cause a big headache when trying to figure out what cable does what. Invest in solutions that keep cables and wires hidden from view and that keep them separate. A USB hub is a good option that lets you plug several devices into your computer using just one USB cable. With the amount of electronic equipment that most home offices have, it is recommended to also have a surge-protected power bar to prevent your computer and other equipment from frying during an electrical storm or another power surge. For the rest of the wires, you can bind the cables together with cable ties or use J-bolts so they stay in one place and out of the way. 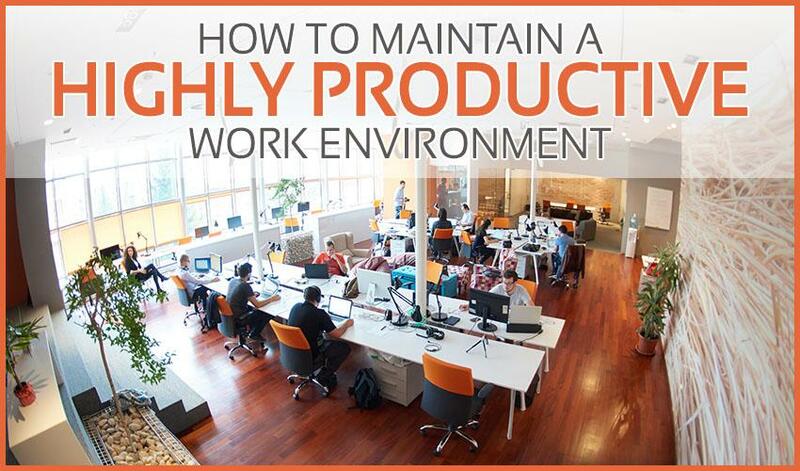 Building a productive work environment is only one side of the equation. Once you have the needed tools, it is important to establish daily habits that will help increase overall productivity. If you work from home, try to stick to a normal schedule. For many, that can be working a 9-5 day, but, for others, it may be working nights. Whatever your preferred schedule, it can help increase productivity if you follow a concrete working schedule every day. One of the benefits of working from home is that you can do so in the comfort of your pajamas but getting up and getting dressed as if you are going to the office can help increase productivity. Create priority lists by arranging tasks in order of importance. It is also helpful to only have a few tasks that you need to accomplish that day, rather than a list with twenty or so “to-do”s. Your tasks will range from easy to complicated, and it is a good idea to identify your way of working. Some people prefer to tackle the easy tasks first before moving onto the larger projects. If you do have a task that is larger, it is helpful to break them into multiple smaller tasks. For example, if you have a large presentation to complete, focus on completing a section of the presentation one day at a time instead of trying to do the whole thing in one day. Set deadlines and stick to them. Another good tip is to spend a few minutes every day setting up your priority list for the next day. It will help you stay organized and can make things feel less overwhelming. Designate times to handle email. While the urge is there to quickly respond to every email right away, try to limit responding to emails immediately that are urgent. Otherwise, block out time in your day to thoughtfully respond to the emails you have received. Constantly stopping what you are doing and responding to emails right away is a waste of time and decreases productivity. While it may seem counterproductive, taking breaks has shown to help increase productivity. If you spend more than 8-10 hours at a desk without moving around much, then you will notice that you have less energy. Do yourself a favor and take a break. Go for a short walk, move around the office, go outside and get some fresh air. Physical activity will greatly increase your energy levels and, therefore, your productivity. Weed out distractions. Information technology has done wonders for productivity, but it has also hindered it with the number of applications available. Today, it is very easy to get distracted by Instagram, YouTube, and Netflix. In the U.S., over 12.2 billion collective hours are spent browsing on a social network every day. This is costing the U.S. economy around $650 billion per year based on each social media user costing a company roughly $4,452 per year. Limiting distractions like Facebook and YouTube will help increase focus and will allow you to devote all of your attention to the task at hand. Productivity is all about enhancing available resources in order to increase efficiency. It is about doing things in the best way possible. In order to maintain a highly productive work environment, it is important to build a strong workspace foundation as well as establishing strong productive work habits. Equip your office space with high-performing equipment and make sure your work environment has a strong networking solution. Once you have the tools, remember to get into the habit of making priority lists and limiting distractions. Implementing this two-part strategy brings you that much closer to maintaining a highly productive work environment.